Diane Keaton has spent a lifetime coloring outside the lines of the conventional notion of beauty. In Let’s Just Say It Wasn’t Pretty, she shares the wisdom she’s accumulated through the years as a mother, daughter, actress, artist, and international style icon. This is a book only Diane Keaton could write—a smart and funny chronicle of the ups and downs of living and working in a world obsessed with beauty. In her one-of-a-kind voice, Keaton offers up a message of empowerment for anyone who’s ever dreamed of kicking back against the “should”s and “supposed to”s that undermine our pursuit of beauty in all its forms. From a mortifying encounter with a makeup artist who tells her she needs to get her eyes fixed to an awkward excursion to Victoria’s Secret with her teenage daughter, Keaton shares funny and not-so-funny moments from her life in and out of the public eye. 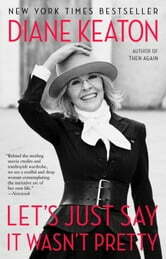 For Diane Keaton, being beautiful starts with being true to who you are, and in this book she also offers self-knowing commentary on the bold personal choices she’s made through the years: the wide-brimmed hats, outrageous shoes, and all-weather turtlenecks that have made her an inspiration to anyone who cherishes truly individual style—and catnip to paparazzi worldwide. She recounts her experiences with the many men in her life—including Warren Beatty, Jack Nicholson, Al Pacino, and Sam Shepard—shows how our ideals of beauty change as we age, and explains why a life well lived may be the most beautiful thing of all. Wryly observant and as fiercely original as Diane Keaton herself, Let’s Just Say It Wasn’t Pretty is a head-turner of a book that holds up a mirror to our beauty obsessions—and encourages us to like what we see. Her thoughts on various subjects with details of her life. Got rather tiresome, really. Imagine obsessing over your eyebrows, eeek!